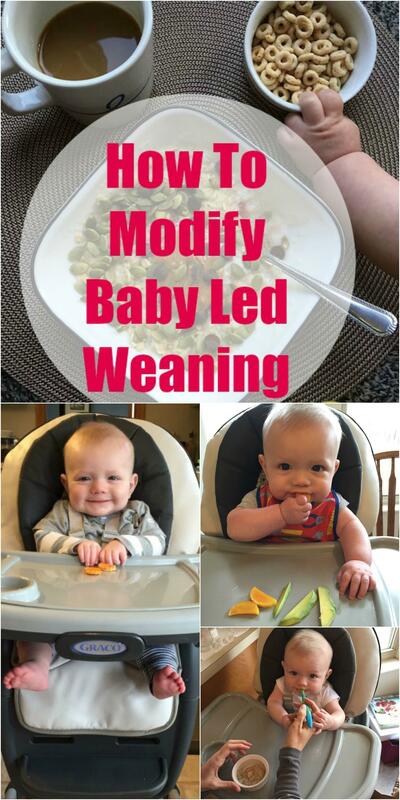 Learn how to modify baby led weaning to make it work for you if you like the concept but are scared of baby choking. I’ve been meaning to write this post forever and I’m finally getting around to it! I get questions all the time about how I feed Squish and now that we’ve been at it for about 3 months now, I thought I’d try to put everything I’ve done so far in one post for easy reference! To give you some background information, Squish has always been a good eater. He was a big baby (9 pounds when he was born) and due to my struggles with breastfeeding he’s been formula fed for a while now. 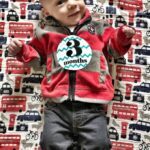 When we went to his 4 month appointment, our pediatrician advised us to hold off on solid foods until as close as six months as we could but to also pay attention to max formula recommendations. 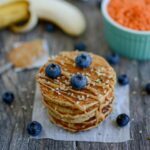 I loved the idea of baby led weaning but wasn’t ready to commit 100% at first, so here’s how I modified it to work for me. 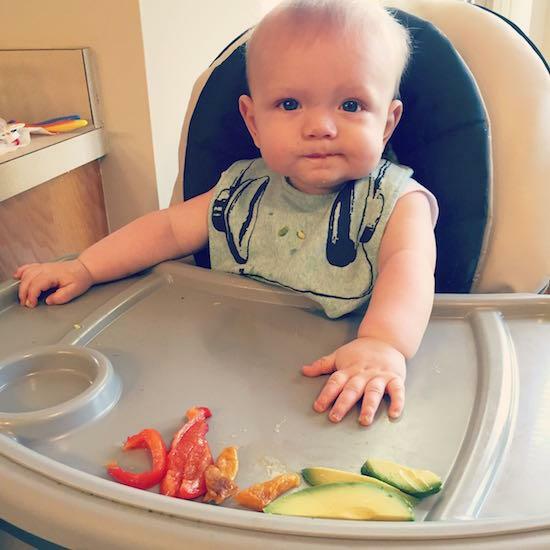 In case you’re unfamiliar, the general concept of baby led weaning is allowing your child to feed themselves (no purees) and choose what they want to eat from the very beginning. By 18 weeks, Squish was making it quite clear that he wanted to eat food. We gave him a few tastes of things here and there (that video was March 6, 2015, he was born Oct 29, 2014) over the next two weeks but I wanted to hold off a bit longer to give his digestive system as much time to mature as possible. I also let him nom on some cold cucumber slices and raw carrot sticks just for texture. By 20 weeks he was able to sit up unassisted for short periods of time, he was always very interested in what we were eating and he constantly made attempts to grab food off our plates. He was also maxing out the daily recommended amounts of formula at 35-36 oz per day. We decided it was time so we ordered him a high chair and dove in! 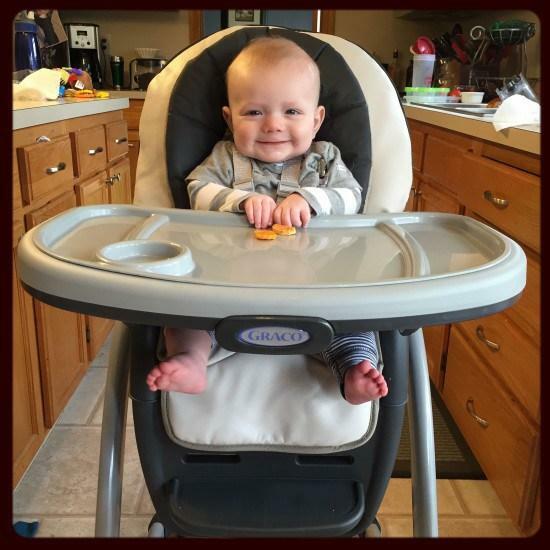 (For your reference, the high chair we have is the Graco Blossom 4-in-1 Seating System and we love it! Just before he turned 5 months we started giving him a little solid food almost every day. I decided from the beginning that I didn’t really want to give him a lot of purees. 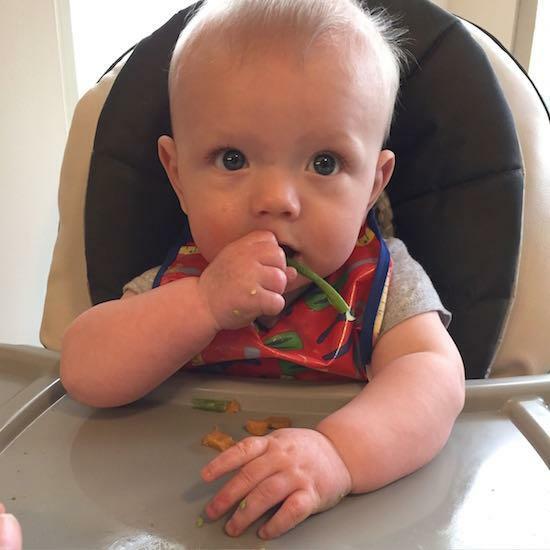 I like the baby-led weaning approach because it helps introduce them to different textures and practice chewing at an early age. It was actually pretty amazing how good he was at chewing from the very beginning. Although I like the theory of baby-led weaning, I knew I’d need to make a few changes for my own comfort. From the very beginning I let him practice grabbing things for himself. 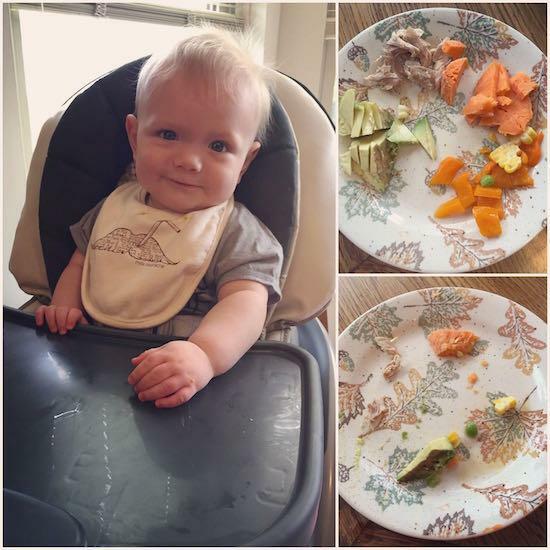 His first two foods were sweet potato and avocado and those first couple weeks he also tried carrots and butternut squash. I cut the veggies into sticks and then alternated between roasting and steaming them. At this point, he seemed to prefer steamed to roasted. For the avocado I just cut it into chunks and gave it to him. Although I wanted him to practice his coordination, giving him total control of how much he bit off still scared me a bit so I watched super closely and took larger pieces out of his mouth occasionally. For the avocado I just cut it into chunks and fed it too him since it was too slippery for him to pick up. After letting him practice a little each day, I usually just broke the veggies into chunks and fed those to him one at a time so he could chew them. I also started giving him oatmeal around this time. I made my own from the very beginning using this recipe- Homemade Oat Cereal For Babies. Right now you’re eating solid foods twice a day. Usually around lunch time I’ll give you a few finger foods – 2-3 slices of avocado and 2-3 veggie sticks. It can get a bit messy but you actually manage to get almost all of it in your mouth. Around dinner time you eat about a tablespoon of oatmeal. You’re still drinking your formula as well. We bought these Born Free Glass Bottles and absolutely love them! Now that you’ve started eating some solid foods, you’re drinking 5-6 bottles a day…anywhere from 24-31 ounces. You love to eat and have been eating solids for over a month now. 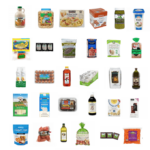 We didn’t really try any new foods this month. You still love avocado and sweet potato and roasted red pepper strips are another favorite. We switched you to all 6 oz bottles and you typically get 5 of them per day and then around lunch time i’ll give you some solid foods while daddy eats his lunch- usually a couple strips of red pepper, a couple sweet potato or squash sticks and some avocado. I usually give you a couple tablespoons of oatmeal and some fruit in the evening. Admittedly I got a bit lazier over the next couple of months and found it just easier to feed him chunks of food and let you chew them, rather than letting him try to feed himself as much. I still let him practice, just not as often. I felt good about it because he was still chewing, experiencing different textures, etc but I also had greater control over the size pieces he were getting. At his six month appointment, he got the all clear to eat pretty much anything that wasn’t a choking hazard (like chips, popcorn, etc). 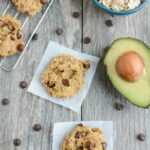 Previously it was recommended you wait a bit longer to try certain foods due to food allergies, but that’s no longer the case, especially since our family doesn’t have a history of food allergies. He also got the ok to start drinking water from a sippy cup. Right about 6 months he started sitting in a high chair when we went out to eat. I don’t give him a ton of water but I keep a sippy cup in the diaper bag for when we’re out because it’s a good distraction…and I’ll give him some after we go on a walk if it’s hot out. 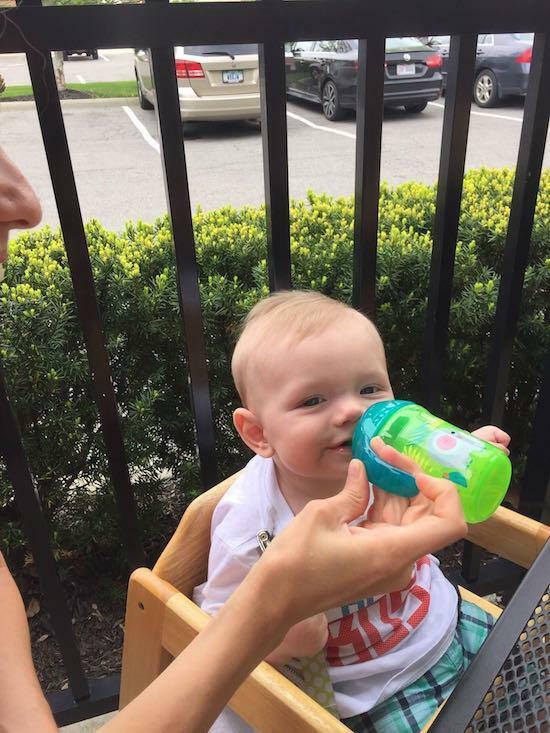 I also started giving him Gerber Puffs while we were out to eat because they were a good distraction. I started with these because I thought they dissolved most easily, but I learned that Cheerios are actually specially formulated to dissolve easily for babies so I’ve switched to those since I eat them anyways. We still have milk, shellfish, soy and peanuts left to try. You’ve also started eating meat. You’ve had chicken thighs and pork tenderloin so far. You’re still loving all your favorite fruits and veggies from previous months as well. Depending on our schedule for the evening, sometimes I’ll give you some more food while we’re eating dinner to keep you busy…other times you’re sleeping while we eat. Around 9pm I give you some oatmeal mixed with scrambled egg and prunes. (You have some issues with pooping regularly so we give you prunes every day). 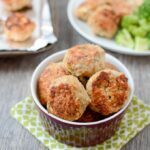 During this month he also tried little pieces of chicken thigh, pork tenderloin and turkey meatballs. Now that he’s getting fairly comfortably with eating regularly, my goal is to start encouraging him to feed himself more and more. Every morning I give him a few Cheerios to practice grabbing. He’s getting better about getting them with his two fingers, but he has trouble getting them into his mouth. I also want him to start choosing what he wants to eat more and more out of the foods I offer him. Every weekend I prep a few veggies and some oatmeal with an egg for him while I’m doing my Sunday Food Prep. Over the next few months, I anticipate he’ll he more and more of what we’re eating. I’ll be back with Part 2 in a couple months! Again, I realize this isn’t exactly baby led weaning, but it’s definitely a different approach than starting with all purees. For us, it’s been a nice combination approach that’s been working well for us! 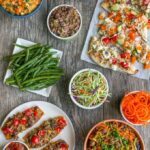 Want to learn more about baby led weaning? 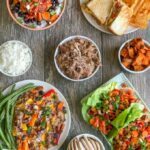 Here’s how @Leangrnbeanblog made it work for her! great post! 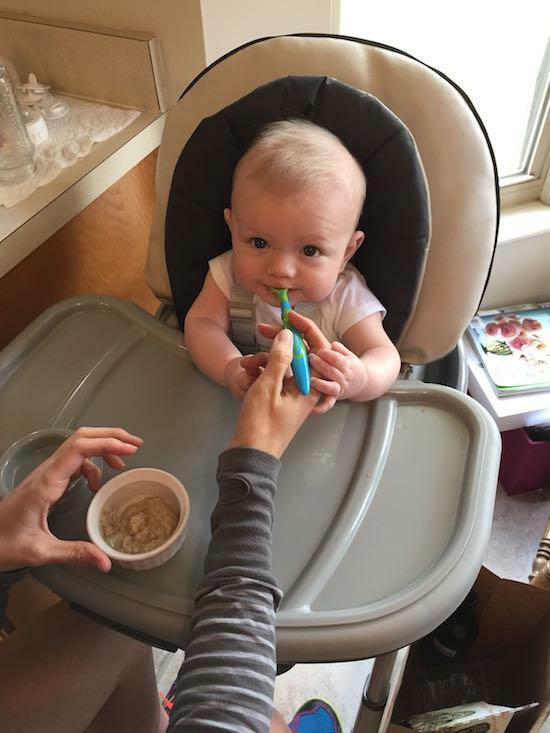 i definitely wish i would have started with blw because william definitely had trouble chewing – he’s getting better now, but he still definitely loves oatmeal and yogurt…. aka foods he doesn’t have to chew lol but his favorite foods are chicken, turkey, and eggs – protein all the way! haha the only fruit he loves is bananas and the only veggies are sweet potatoes and carrots! Great post! We did something similar with my first and are starting to with our second now! We started with purees for both, but they quickly grew disinterested in being fed by spoon. We also did the same with puffs/cheerios for restaurant distraction! 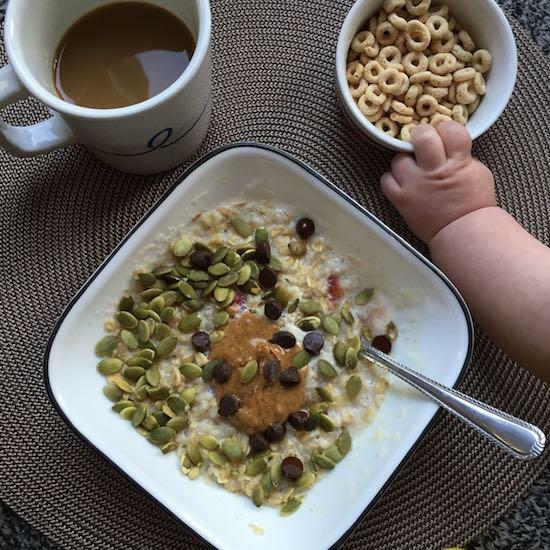 I love the pic of Chase’s little hand reaching for the cheerios! I was kind of forced into more of a baby-led weaning approach with Luke when he pretty much refused my homemade purees. (The nerve! :)) I admit that it scared the heck out of me to give him pieces of food like that, but he did great with it and I learned that gagging and choking are not the same thing! No matter how you feed your little one, I think it’s so fun to see them discover new tastes and textures. He is just so darn cute, and such a good eater! Since you were on formula vs breast feeding I suppose iron wasn’t a concern for you. Would your approach have changed if you were breastfeeding? 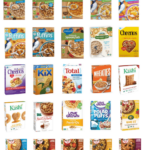 IE starting with iron fortified cereals and meat? Emma Kate likes to be fed and isn’t a fan of using the spoon yet. Her pincher grasp is pretty good but shes not a fan of chewing a lot of things just yet. She still takes about 32 oz of formula a day though! This is a great post! I just forward it to my friends with LO’s. 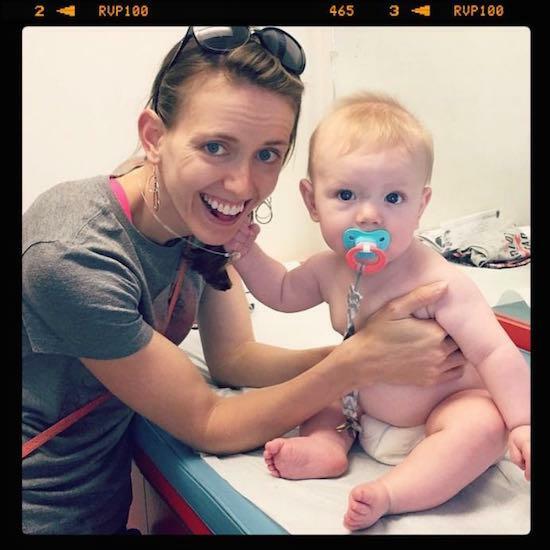 I struggled with the BLW approach because day care would only spoon feed. So we did almost exactly what you did and it worked so well for us! Oh little man eats everything and has a healthy appetite. I really enjoyed cooking for him and was always excited for him to try new things! He is also really good about chewing things and he knows when to spit it out if he has too much in there. 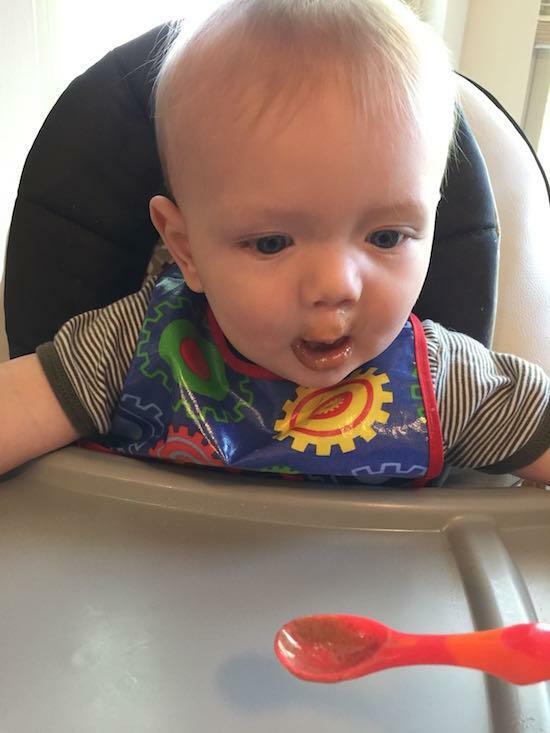 He is just over a year and he is learning to feed himself with a spoon. They grow up so fast! Enjoy it! So glad to read that he did so well transitioning to real food. It’s a great post and lots of very helpful tips. Thanks so much for sharing! Curious about your thoughts on puree’s and why you didn’t want to go with those first? Did you write about it and maybe I missed it? i don’t have anything against them…i just don’t think they’re really necessary. 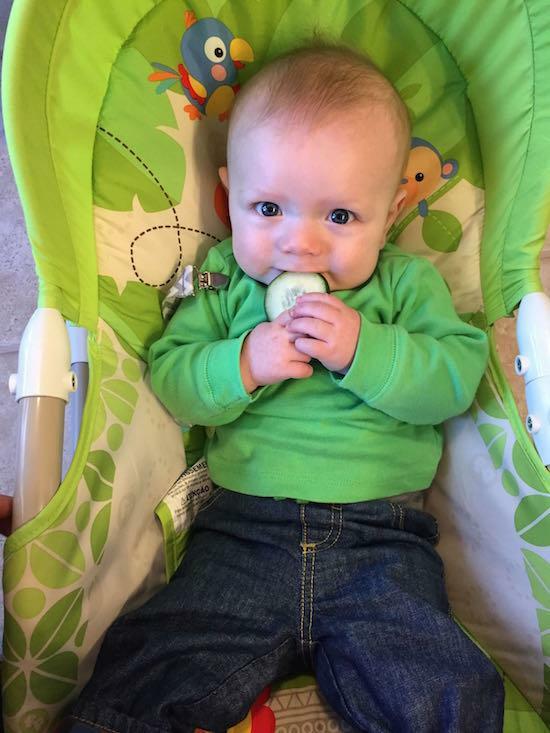 He was perfectly capable of chewing/gumming soft things from the very beginning and i liked that it helped him learn to chew early instead of just swallow. i’ve also heard it helps them be more accepting of textures as they get older but haven’t experienced that yet so i’m not sure. but every kid is different. i know a lot of moms who tried BLW and their kids wanted nothing to do with it and just wanted purees. This was one of the best decisions I have ever done! I LOVED BLW!! Thank you so much for sharing your experiences! Aubrey’s now 4 months and eating six 5.5 ounce bottles a day and I’m starting to think about how to introduce her to real food and I’m so conflicted and confused as to what to do, and this helps. LOVE this! 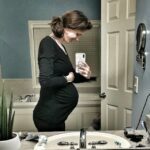 I did BLW with both of my sons, but with the second one it sounds like we had similar experiences! No, at that age I just made sure everything was soft. 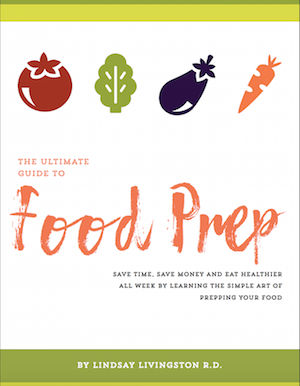 Things like small chunks of roasted vegetables like carrots, sweet potatoes, red peppers, small pieces of meat like pulled chicken, soft fruits like banana, avocado, berries, scrambled eggs, etc. You can steam things, roast things, boil them…anything to get them soft.